Here’s a lovely recording that I digitized last year from one of Joseph Drody’s tapes, labelled simply, “Old Songs From MaryEllen.” It features Joseph’s sister MaryEllen Drody-Savidant singing a selection of of old folk, country, and sentimental songs as well as picking a few lively fiddle tunes on the mandolin. MaryEllen is joined by her daughter Debbie Sams on the piano and accordion on several of the performances. You can hear the two sides of this tape at the bottom of this post. The music seems to be drawn from a few recordings including one song, “Beautiful Gaspé,” from a studio recording that MaryEllen and Debbie made in New Brunswick in the early 1990s entitled Cottage By the Sea. I was never able to meet MaryEllen but have always appreciated the gentleness of her music that comes through on the tapes I’ve heard, the perfect music for a quiet autumn evening. 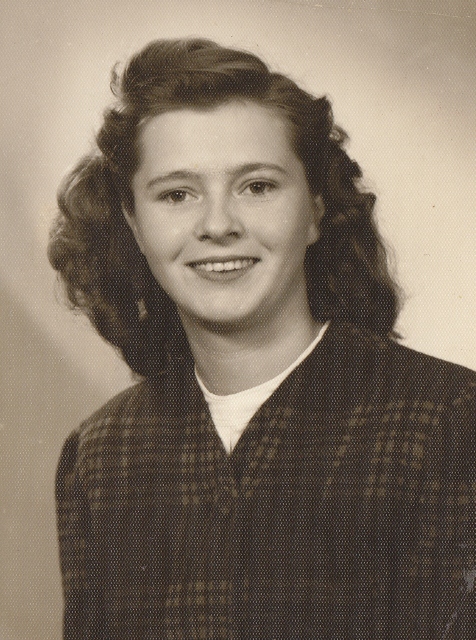 Five years ago, Debbie wrote a lovely bio and tribute to her mother on our Gaspé fiddle blog. Debbie has agreed to let me share her writing once again for this newer blog. MaryEllen was born in Douglastown, one of ten children born to proud parents, Pearl Grant & Joseph Drody. When you think of MaryEllen, the first thing that will probably come to mind is her smile and upright stature and then of course her beautiful clear voice. She had a gracious, calm way about her, and a caring, giving heart. She was probably happiest when she was giving of herself to others. 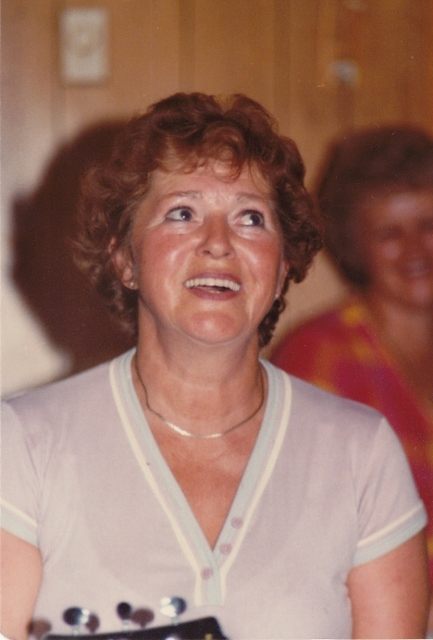 In the early 1980’s, she received a prestigious award from the Canadian Red Cross for 30 years of service to ‘Community and Society’ for her work as a fundraiser and at blood clinics. She was probably one of the first to bring blankets and other goods on behalf of the Red Cross to people who had just been burned out in a fire. I guess her love for music was inborn because we hear of her youth in Douglastown where music took place in the kitchen around the old wood stove nearly every evening and the fiddle was passed around. She began singing publicly at about 12 years old for the St. Patrick’s Concerts in Douglastown at the Holy Name Hall and graced the stage for near sixty years. She is most remembered for her rendition of ‘Cottage by the Sea’. MaryEllen married Calvin Savidant, son of Georgina White & Edward Savidant in August 1949 and together they had three children, Deborah, Susan and Perry who met with an early death at age 11, in 1969. Yes music was her passion and she spread joy wherever she went. She gave of her time with a cheerful heart as she entertained seniors at Monseigneur Ross or at the Golden Age Club, or just visiting a shut-in and sharing a song or two with them. Her guitar was her constant companion. Her generosity was also evident if you were fortunate enough to grace her dinner table. You would never be able to get away without having seconds. How many times she made a cake to bring someone who needed a little bit of cheering-up? Yes she had a zest for life; fishing, hunting with the guys, and of course, entertaining! 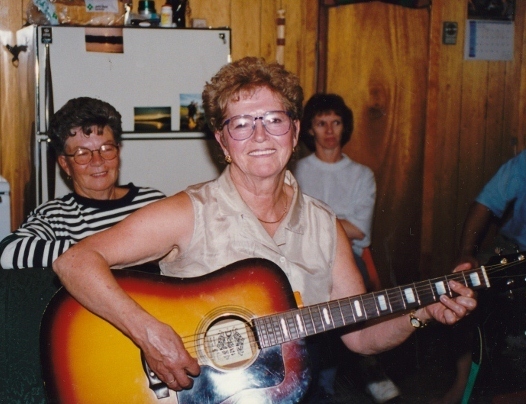 Those countless parties at the cottage that they built at Haldimand Beach that went on into the wee hours of the morning with fiddles, guitars, accordion…. MaryEllen lived a life rich in love of family and friends and her life was filled with music! I just love listening to MaryEllen’s singing! So happy her music has been preserved. I played this tape over and over! Thanks so much for sharing. May God bless MaryEllen and her generous heart! So glad to hear, Lillian. I’ve listened to this one a lot too!